There was an interest in me that was awakened in translating the Holy Qur’an that was not so much devoted to imitating the style of the original in Arabic or in copying the literary style of the original, but rather in transmitting in the correct and most direct way all of the meanings, both profound and spiritual, as well as describing the whole approach of it all, that I had understood when reading and studying it in its original language. –Isa García. When I embraced Islam and accepted it as my way of life, I was thirsty for knowledge. I wanted to learn as much as possible about the primary source of knowledge, the divine revelation: the Holy Qur’an. I knew from the beginning that the Qur’an was revealed in Arabic, and that this text was the original; that it had been preserved and safeguarded intact for more than 14 centuries. But since I did not know Arabic, I had to refer to the various Spanish translations that were available. What I found disappointed me, because many times the text was confusing and incoherent. I understood that the reason for this was due to two factors. The first was that many of these translations were done by people who did not have the necessary knowledge about Islam, its message, and its history. Because of this, certain concepts were misinterpreted and erroneous. In some cases, there were premeditated attempts to discredit Islam and its holy book by altering the meanings. Furthermore, most of the translations are too literal, imitating the Arabic style not only in the expressions used but also in the word order. The result was that the normal grammar and syntax used in the Spanish language were not utilized, resulting in confusing translations. Add to this the fact that the language used is archaic and almost foreign, in a style that is seldom used in Latin America. Also, most of these translations do not have clarifying notes regarding historical and legal contexts. Later on, when I had the opportunity to study the Arabic language and I began accessing the meanings of the Holy Qur’an in its original language, I understood that I had lost much of the meanings and contexts through the translations I had read. It is a fact, however, that there are no translations that can approximate the beautiful narrative and the poetic rhetoric of the Qur’an, nor can any translation reproduce its eloquence or the multiple ways in which it can be recited. It is also true that the translations, some more than others, fail to convey to the reader the real essence of the Quranic message. This awoke in me an interest in translating the Holy Qur’an that was not so much devoted to imitating the style of the original in Arabic or in copying the literary style of the original, but rather in transmitting in the correct and most direct way all of the meanings, both profound and spiritual, as well as describing the whole approach of it all, that I had understood when reading and studying it in its original language. Alhamdulillah, I could finally embark on making a translation of the Holy Qur’an for the benefit of the Spanish-speaking world, but mostly for the benefit of Latin America. Along with a team of experts, I have tried to provide Muslims and non-Muslims with the message of Islam in the closest possible form to the original revelation in Arabic, but at the same time using language that is simple and plain, and also using explanatory notes for certain terms so that the content of the text is easy to understand. While Islam still is not one of the major religions with a large number of followers in Latin America, it is growing rapidly throughout the continent. There are now mosques in all of the major cities in Latin America and conversion to Islam is also a growing phenomenon among the Hispanic populations of the United States. Firstly, for those Muslims who do not know the Arabic language, they need to read the meanings of the Qur’an in their language to understand and better practice their religion. In this way, they can be good examples of what it is to be a Muslim. Secondly, for those non-Muslims who desire to learn about Islam, they need a reliable source of information. This will let them form their own opinions based on what the Qur’an actually teaches and not on stereotypes and erroneous ideas that have lasted for centuries in many of the works by Orientalists and in some of the translations of the Qur’an. 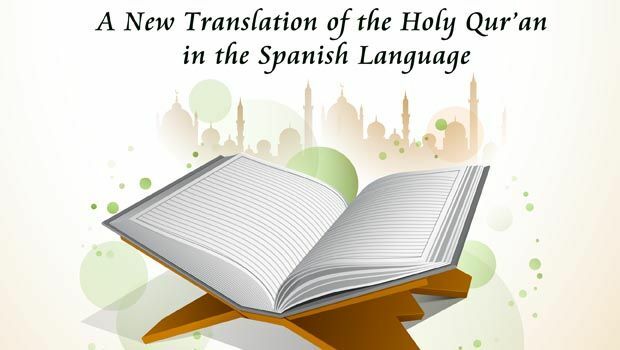 From there, the objective of this translation is to present to Spanish-speakers the real message of the Qur’an, how it was known, understood, and practiced by the scholars of Islam and by the devout Muslims for more than 1,400 years. The translation is based on clear and simple language with a direct and contemporary message with the Latin American public in mind. The goal of this translation is free distribution so that in this way it can be available to the maximum number of people possible. To achieve this goal, it has been distributed in a digital version in PDF. It has been added to various programs on multiple platforms. It will soon come out in its own unique reading and audio format. Also, many were printed for the free distribution to the public. The first edition included 50,000 pocket-sized books for free distribution during the 2014 World Cup in Brazil. Also, 100,000 copies were printed in Qatar to be distributed throughout the world. In Latin America, in particular, many small printings have been made in Bolivia, Colombia, Guatemala, and Mexico. In Spain, the distribution has begun for a project that has already printed 10,000 copies.